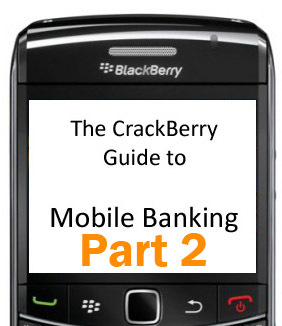 Welcome to part two of the CrackBerry Guide to Banking on your BlackBerry. I hope you enjoyed the first installment, in which we took a look at Bank apps and launchers. In part two, we will be rounding up applications and presenting you with the best of the third party banking and finance tracking applications. Some applications can provide access to your account, just as the mobile site for your financial institution. Others, which have little or no access, can still assist you in tracking how your money travels into and out of your bank account. If you prefer standing in line, waiting for a bank teller, then read no further. If you yearn to keep your bank account accessibility as mobile as your wallet, then take a look at these applications. 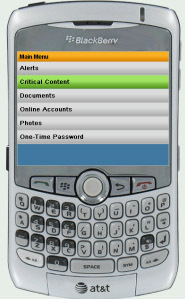 Whether you feel confident about mobile access to your account or not, your BlackBerry has you covered. As with part 1, this list of banking applications will be updated as more applications pop up. The apps below are divided into two categories; apps with and without access to your bank account. Personal Assistant definitely lives up to its slogan “the most effortless way to manage your life online, anytime, anywhere”. While it also helps you manage shopping and travel itineraries, the application shines at shedding light on your bank account, credit cards and investments. Thousands of financial institutions and service providers are supported; allowing you to review transactions, payment reminders and possible fraudulent activity. Personal Assistant is available in both a free and premium version for $6.99. The premium supports an unlimited number of accounts, real time flight information and increased security. MobileLockbox handles both your financial and personal information. 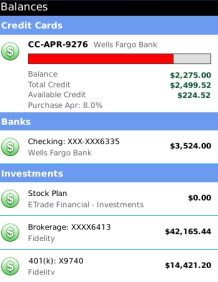 Most types of online bank, credit card or investment accounts can be added to the application. Alerts can be set to help you manage accounts and be notified if anything is amiss. While you cannot perform transactions in MobileLockbox, the application will redirect you to the mobile site of your institution. Besides finances, the application acts as a secure storage area for logins, passwords, and various personal files. MobileLockbox is available for an annual fee of $29.99, the app itself is free. This application definitely makes a splash in the financial world. SplashMoney not only connects to hundreds of banks, but supports numerous types of accounts (line of credit, liability, etc). Your account history, including transactions, are downloaded for your viewing. Armed with this knowledge, you then use SplashMoney to help set budgets, reconcile statements, view/print reports or schedule transactions and reminders. 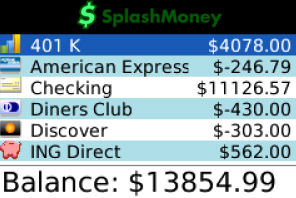 SplashMoney is available for $9.99. In part one, we mentioned the Mobile Banking and Mobile Money applications as well. 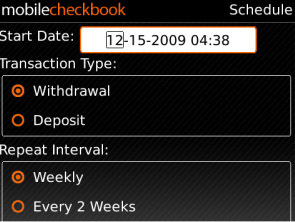 Mobile Checkbook is an extremely reliable financial application. Record your transactions as they occur and eventually you will see where you could save. You can compare the available balance with the cleared balance. Recurring transactions and transfer of funds are also easily managed. Multiple currencies are supported. 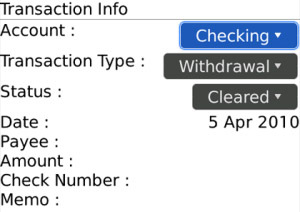 Your transaction lists can be sent via email as a QIF or XLS attachment. Mobile Checkbook is available for $9.99. eCheckRegister is a similar application; allowing you to note occurring and recurring transactions for multiple accounts. 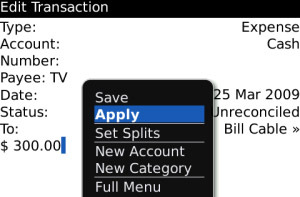 Transactions, including account transfers, are quickly and easily recorded. The application can help you send off your history in a CSV file or HTML format. eCheckRegister costs $9.99. If you feel that your paycheck is gone not too long after it’s deposited, it’s time to set a budget. miBudget lets you set monthly budgets and mark down your expenses. The budget and expenses are compared on an easy to view progress bar. When it’s time to put your money where your mouth is, miBudget provides graphs to show how well (or not so well) you are doing. You may even find areas where you could spend a bit less and where you can save for a new BlackBerry. miBudget goes for $5.99. Ascendo Money is an extremely in-depth financial application. Multiple account reports can be created and viewed, covering your spending by category, payment method and payee. 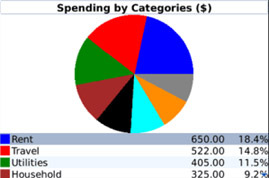 These reports can be displayed as a pie chart or bar graph for easy to decipher comparisons. Other options include budgeting, scheduling future and recurring transactions and email reporting. Another powerful feature is the ability to forecast the balance of your accounts, so you can see if any adjustments need to be made. The Ascendo Money BlackBerry and Windows Desktop suite is available for $29.95. Worried about an investment? Not sure about loan repayment? CashflowHawk is designed to help you find the answers. 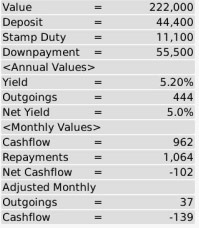 The application allows you to calculate the following; Property Cashflow, Loan Repayments, Investment Returns, Investment Time to Value and Maximum Loan (what can be borrowed based on the repayment figure). CashflowHawk costs $2.99. As I mentioned before, this list will be updated as time goes by. 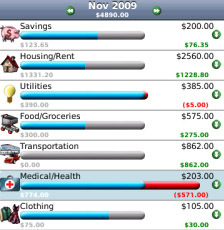 Please feel free to share with everyone which applications you are using to help you manage your finances.